Harith Hasan is a writer for Al-Monitor and the author of Imagining The Nation, Nationalism, Sectarianism and Socio-Political Conflict in Iraq. He is part of a new generation of Iraqi writers that are exploring the meaning of nationalism and sectarianism. In his book he made a historical analysis from the Ottoman times to the present of how Iraq as a country was formed by colonial powers, the ruling elite, and their interaction with the public. Rather than seeing nationalism and sectarianism as static ideas, he has argued that they are both concepts that have changed over time based upon the socio-political situation within Iraq. Here now is an interview with Harith Hasan. Hasan can be followed on Twitter @harith_hasan. 1. People like to say that Iraq is a made up country created by European powers after World War I as if this is exceptional. In fact, most countries in the world experienced the same thing. This caused a dilemma for the British and the monarchy that it installed when it came to building this new state. What kind of nation building policies did the first generation of Iraqi elite follow and how was that shaped by British interests? No question that the post-colonial state in Iraq and the Middle East Region, especially the Levant was largely shaped by external decisions, more than indigenous processes. However, all “nations” have elements of artificiality and their collective cultures are to different extents constructed through state-led integration and the “invention of traditions”. I think that rather than distinguishing between artificial and “natural” nations, it is better to draw the line between successful and unsuccessful “nation-building” experiences, and certainly Iraq falls in the second category. 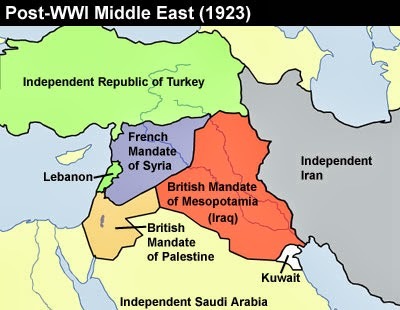 The collapse of the Ottoman Empire and the distribution of the spheres of influence between Britain and France led to the creation of the modern states in Iraq, Syria, Jordan, and Lebanon within their current territories. The interest and policies of colonial powers, thus, were the most effective causes for the ‘invention’ of these states. However, the need to legitimize these new entities- in a time when the discourse of self-determination was progressing – required converting them into nations. This is how the ‘nation-building’ process was initiated to ‘invent’ cultural symbols and origins for the new states. Sometimes this process was paradoxical, for it sought to consolidate a power center controlled by an elite that was selected and backed by a foreign power, simultaneously with the invention of an indigenous origin for the new state in order to legitimize its existence. The colonial empowering of these elites aimed to assure that the new state would be functional within the scheme of interests of the colonial center. This meant that the power structure had to be shaped accordingly, by excluding those social forces that either resisted integration to the colonial sphere, or delegitimized the new entity. In Iraq, this has taken place through marginalizing those forces that led the 1920 revolt against the British occupation. These movements were heterogeneous socially and culturally, but their struggle seemed to have developed a sort of indigenous nationalism which has been defined against the colonial ‘other’. This process was interrupted by the colonial making of the Iraqi state; in fact, the latter, was originally founded to curb this indigenous nationalism. This laid the foundation for the conflict between the official Arab-nationalism, which was embraced by Sunni Arab elites that ruled Iraq in most of its modern history, and a vague territorial nationalism that tried to be inclusive for disenfranchised segments and marginalized identities. The failure to ‘invent’ a national narrative which could make the ‘cultural’ sphere congruent with the ‘political’ entity, was a cause and a consequence for the governing elite’s failure to negotiate with indigenous social forces in order to create an inclusive sphere of legitimacy, accommodating the multiple cultural identities within the territorial state. Consequently, a chronic problem was produced: the state seemed to have been established ‘over’ rather than ‘from’ society. It was not representative, at least proportionally, of the social forces and interests, as much as it was an organizer for their oppression. 2. Internally there were problems with nation building between the well off urban elite and the poor rural majority. What issues developed between these two groups as Iraq tried to modernize? The history of large segments of Iraqi society during the Twentieth century is largely the history of a post-tribal society. Modern Iraq as a national community did not exist before 1921. Its territory was inhabited by diverse communities, most of them were tribal. The tribe is a primordial community based on kinship solidarities and collectivist economic relations. There was no power hierarchy within the tribe, but customary leadership in which the tribal chieftain (Sheikh) had a moral authority. With the penetration of tribal structures by modernization and capitalist economy, they had to enter a long process of dissolution and breaking down. This process started almost one century before the foundation of Iraqi modern state, but its consequences are still shaping social relations and conflicts in Iraq. This was when the majority of Southern tribes converted to Shi’ism, giving this sectarian identity a numerical majority in the territory which would be called ‘the modern Iraq’. The next process of tribal dissolution was reinforced by two dynamics: the Ottoman reformations and the capitalist penetration. The two dynamics met at emphasizing the organization of agricultural properties through modern means that did not recognize the tribal collective ownership. This was when the Sheikhs took over the ‘tribal property’ and became landlords, while tribesmen were degraded from their egalitarian status into the status of paid workforce. Capitalism in Iraq led to the emergence of a type of feudalism, enhancing thereby the largest migration from countryside to the cities in the last centuries. The migration was intensified by the unjust relations between the landlords and the peasants, and the inefficient exploitation of lands which decreased their production. 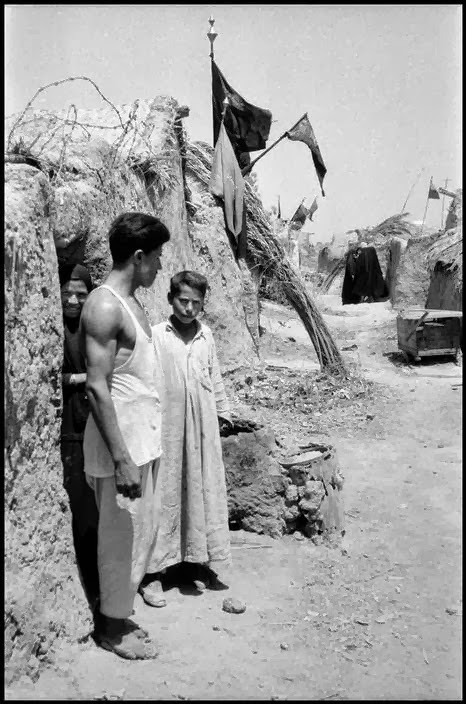 As Iraq entered the ‘Oil Age’ and the government accumulated most of its resources from oil exportation, agriculture was further neglected and the cities attracted more migration by rural families that were looking for better conditions of living and job opportunities. This process was largely random and neither the state nor the urban societies were capable of absorbing its consequences. As much as it led to further dissolution in the old tribal relations, it changed the nature of the city, creating large social spaces in which the distinction between tribal and urban cultures is difficult to be made. These large spaces represent what can be described as the post-tribal society, a society which is neither tribal (in the traditional sense) nor urban, but a mixture or, more correctly, a unique misrepresentation of the two. The post-tribal society is characterized by an intense cultural perplexity due to its transformational, mobile, uncertain, and changing nature. This is a context where ideologies like Islamism can thrive. 3. 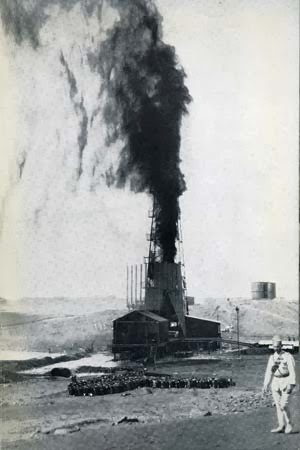 How did the discovery of oil effect the national building process in Iraq? Oil reinforced the exclusionary nature of political power in Iraq. The incomplete modernization in Iraq has been characterized by the contradiction between the state’s aggressive tendency to repress cultural diversity, and the increasing exclusionary nature of the authority. While the state managed to achieve more integration on the economic, military, and administrative levels, it was becoming more discriminative on the political level, particularly in the most authoritarian period (1968-2003). In this period, the elite sought to establish a non-egalitarian nationalism; one that secured some kind of legitimacy while maintains the exclusionary characteristics of the power structure. Such a tendency was only possible by the transformation of the Iraqi economy as a result of the growing dependency on oil, which provided those who controlled the state with more autonomy from –and capacity to control- the civil society. In the oil age, the transformation of Iraq into a post-rural society was accelerated, re-enforcing a distorted modernization characterized by the mass migration from an impoverished countryside, random urbanization, lack of extensive industrialization, and a highly authoritarian economy. The Ba’ath regime’s authoritarianism and its internal transformation from a party-based into a kinship-based authority were also affected by this change. The growing revenue of oil made it easier for the governing elite to rule independently from their own society and to disrupt the social dynamism via unprecedented repressive policies. Authoritarian policies aimed to secure social demobilization, particularly through a tacit exchange with the society, according to which the government sought to guarantee a minimum level of social services and employment while the latter would be reluctant from questioning its political legitimacy. The financial capacity gained by the governing elites allowed them to expand their patronage networks, thereby neutralizing some important social forces. They were also functional in securing a protection for the governing elites through loyalty-based relations that helped to infiltrate civil society and to largely subordinate it. 4. From the 1950s-1980s Pan Arabism/Arab nationalism became leading ideas for Iraq’s elite. How did that became an exclusionary ideology for the country, why did Saddam change it, and was his rule sectarian? The type of authoritarianism Saddam Hussein established in Iraq was also based on the exploitation of socio-cultural fragmentation. The relatively high economic independence enjoyed by power holders through their rent-based rule, strengthened their tendency to ignore the state’s ‘representative function’. Instead, they sought to politically neutralize or to control ‘society’ through preventing natural social dynamics from developing and reaching the political surface. One way to achieve this goal was to prioritize ‘loyalty’ in building their patronages, distributing jobs in the military and security organs, and economically favoring some sectors via the leading role the state was playing in the ‘national economy’. This was taking place in tandem with the transformation of the power structure itself to become increasingly built upon a grand figure, the small nucleus around him, the security apparatuses loyal to him, and the patronage networks associated with this nucleus. A sort of ‘shadow state’ was forged beyond and despite the official institutional build-up. The latter lost any credible role and became a merely formal façade of a system whose real power relations were entrenched in the ‘shadow state’. Those power relations were not officially institutionalized because they opposed the ‘official’ grand narrative the regime had inherited from its revolutionary past, which emphasized the values of ‘republicanism’, ‘popular democracy’, and ‘popular sovereignty’. The ‘shadow state’ deemed ‘loyalty’ the most important gluer to secure its continuity and internal cohesion. However, ‘loyalty’ was not something manifested through words only, nor could it be built through short-term interests conformities. It was to be found in more ‘rooted’ and ‘solid’ attributes such as kinship, blood relations, and regional or provincial affiliations. Those factors were very crucial in building the shadow state, staffing its critical apparatuses, and contriving its patronage networks. Consequently, they also became crucial elements in determining the individual’s chances of social mobility and the access to power structure and its benefits. The increasing significance those factors were gaining under Saddam’s regime can similarly be explained by the nature of the dominant elites, whose members descended from rural or semi-rural origins. Since the primordial identities are multiple and overlapped, it is natural that political nepotism would bear multiple levels of favoritism and discrimination. Saddam Hussein was widely considered to have based his power on sectarian discrimination. Members of Arab Sunni community were presented better opportunities for working in the security and politically important positions, and gaining access to the ‘shadow state’ and its patronage networks, including state contracts. In addition, they dominated the leading positions in the government. However, this by no means signified that the authority was ideologically ‘sectarian’ or believed in the ‘superiority’ of the Sunni community. The regime’s ‘sectarian’ character is more a coincidence rather than a result of purposeful policy to favor the ‘sect’, especially if we notice that it was controlled by non-religious personalities. The sectarian ‘character’ was derived from policies of political clientalism that favored people coming from the elite’s ‘communal’ or ‘regional’ background. This created a situation in which a chain of political favoritism was built from family level to ethnic and sectarian levels. There were favorite families, favorite tribes, favorite regions, favorite ethnic groups, and, consequently, a favorite sectarian community. 5. 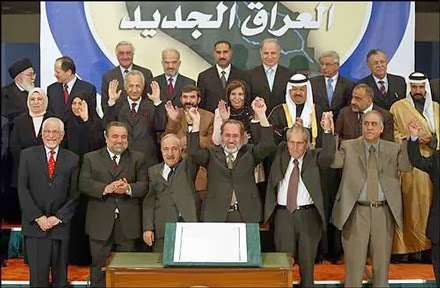 After Saddam’s removal in 2003 a new group of parties took over the government. They all had different visions for Iraq, but all saw themselves as victims one way or another. Can you explain these differences and similarities? Long years of authoritarian rule had reduced the chances for the emergence of a credible cross-ethnic or cross-sectarian political alternative. The sanctuary provided by traditional institutions and their respecting identities was not in favor of a national public sphere. Society was compelled to be divided between those who benefited from the continuity of the authoritarian regime and those who were marginalized by it. When this social rupture overlapped with cultural segmentation, it had destructive consequences for the livability of the national community. As a result, the opposition was also transformed into an exclusionary ‘group’ which adopted the narrative of the ‘victim’. It sometimes reserved the desire of revenge or at best aspired to exchange positions with the dominant elite. The Iraqi opposition in its formation and discourse became part of the dilemma rather than a break from it. In other words, the exclusionary opposition facing an exclusionary authority would only be able to reproduce socio-cultural fragmentation rather than overcoming it. The Ba’athist system of exclusion was legitimized by a Pan-Arab narrative which deemed Arabism as the main identity for Iraq. Sectarian identities were seen as ‘reactionary’, externally imposed, and divisive. Islam was accommodated to this understanding. It was appropriated in this ideology to be the ‘message’ of the Arab nation rather than being the identity. The ‘marginalization’ of Islam in the Pan-Arab state, at least till the 1990s, was rejected by Shi’a Islamism which started to consolidate itself in the 1960s. Islamism has emerged in the region to represent a more indigenous type of nationalism; one that resents Western secular ideologies such as ethno-nationalism and communism. It has been presented as a self-realization movement which sought to restore the core identity of Muslims. Among Shi’as, it was not only a political ideology, but also a movement for communal awakening. It was born among the ranks of the religious establishment to express the views of indigenous clergy, who refused the quietist apolitical approach of the traditional, conservative school. Moreover, it was an outcome for the change that the very foundation of nation-state has instilled by interrupting cross-national sectarian relations that have been providing Shi’a religious establishment with leadership and resources. National borders did interrupt, or at least, did weaken these ties, to be resulted in a long stagnation in Najaf’s Hawza. Therefore, Shi’a Islamism emerged to express this search for new functions and perspectives. It attracted followers from this community, particularly its middle classes, who were feeling more alienated under the Pan-Arab rule. It expressed a new vision for collective identity that formulated its narratives from elements of the sectarian communal culture. This bond between political ideology and communal interests characterized Shi’a Islamism in Iraq with sectarian traits, adding another variable for the sectarianization of politics. 6. How did America promote and institutionalize this new ethnosectarian politics in Iraq? Most U.S. officials who played a role in building the new system of government after 2003 had in their mind the simplistic narrative that Iraq consisted of three main divergent “groups” and Iraqi democracy should be about representing these groups proportionally. Other important elements of democratization, such as the proven authoritarian tendencies in the oil-dependents economies, were neglected. This is not to say that the new setting of Iraq was only driven the American attachment to this narrative; it was also influenced and shaped by the nature of the exiled opposition. There was no major political party that could represent or include the heterogeneous Iraqi population. The narrative of the three communities was reflected in the composition of the Iraqi Governing Council whose seats were distributed according to various criteria, but the communal affiliation was the main indication. The advantage of this approach was to prevent imposing any formula that did not meet the interests of major communities. However, it also disrupted the evolution of the political system, where the failure to achieve consensus impeded reaching solutions for many issues (e.g. disputed areas, federalism, and resources management). This approach assumed that the Iraqi population did not have a ‘real’ national identity; therefore, they could be divided on the basis of ethno-sectarian identities, that were more ‘real’ than the national one. The problem here is the easiness with which one identity is interpreted as real, essentialist, and eternal, while another identity is realized as inconceivable. According to this formula, some communal identities are given a special legitimacy that other identities are deprived of. The institutionalization of communal identities this way leads to reproduce societal divisions rather than overcoming them, making national community less imaginable. At the same time, it provides those who claim to be representatives of sub-state identities with the possibility to create oligarchic or authoritarian power relations that exclude the majority within their communities. Representing identities may thereby become a representation of abstract ‘constructs’ rather than citizens. It reduces the relationship between the leaders and their constituencies into a communal relationship, marginalizing accordingly the needs that cannot be decoded in this logic, such as equality, liberty, jobs, and social demands. This situation may also produce two types of oligarchy, one on the sub-communal level, and another in the Center, where the oligarchic forces from the different communities share power and resources. Something like that is already happening in Iraq today. 7. How have the ruling parties used sect and control of the state to expand their base and stay in power? Political actors tried to mobilize public support simply by inciting sectarian solidarity. Shi’a Islamists after 2003 found sectarian politics very useful to build a strong constituency. Most of those groups and figures, including Maliki’s party, had no significant constituency when they returned to the country from exile and they needed this sort of identity politics to create such a constituency. So they emphasized Shi’a historical victimhood, defined their oppression under Saddam regime as sectarian one, and stressed the right of “the majority” (defined in sectarian terms) to rule the country. The “majority victimhood” led to the “minority victimhood”. As a reaction, the Sunni Arab community witnessed in the last few years what I called “process of Sunification”. There are new Sunni elites seeking constituency and trying to build influence by playing the victimhood politics. The same happened in Kurdistan as the Kurds often engage Iraqi politics only as Kurds, which was also a sort of disengagement at the same time, because their concern about the communal interest was accompanied by disinterest in other “national” concerns. When ethno-sectarian differences become more institutionalized, political elites lose interest in bridging this gap. This is happening today and in preparation for the upcoming election in which the competition will mainly be intra-communal. 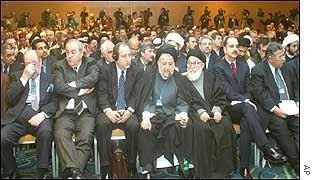 Maliki, for example, has an interest today in mobilizing Shi’as behind him. This is not to simply say that Maliki is more sectarian than other rivals; political positioning depends on the general context and alignments, and politicians seek the position that is more politically awarding. The conflict about who controls the state or the largest share of it continues. The parties of this conflict will keep resorting to mobilize the support through ethnic or sectarian incitement if this remains a functional instrument, and this will always re-generate social fragmentation. 8. You wrote that there are two main approaches to nation building in Iraq, integrationist and consociationalism. What are the differences between those two and which is being used today in Iraq? For those who adhered to the idea of the Iraqi nation as the highest political value, the new nation-building process was unfavorably interpreted as a nation-deconstructing one. For others, it was a return to the ‘original sin’, an attempt to ‘rebuild’ the nation through a stronger base of legitimacy compared to the colonial creation of the state. The two trends conflicted and are still conflicting in Iraq. The new political system was somehow a compromise between the idea that an Iraqi nation actually exists independently from its sub-communities, and the idea that the Iraqi nation is nothing but a total of its sub-communities. The constitutional process, the political conflict and social dynamics were all influenced by the contradicting effects of these two trends. The federal and ethno-sectarian consociational formula on which the new governments were established reflected the strong belief that the ‘national community’ can be built through giving a proportional representation for its subnational communities. The application of this model in Iraq was opposed by those who refused to divide Iraqi identity into subnational identities. For them, Iraqi national identity is more rooted and ‘real’ than ‘sectarian’ identities. This logic of the political system, based on politicization of cultural differences opposed the classical logic of nation-building, which was principally introduced by the ‘Western political thought’ as a model for the post-colonial state. But in the new formula, sub-state identities are no longer deemed a problem that must be eliminated through the homogenizing power of nation-building process. Rather, the objective became the formation of a system of ‘coexistence’ among those identities within one state. However, in practice this system has nourished the idea that communal identity is a social organization which is ‘real’ more than the ‘national’ community itself; the latter is rendered meaningless without the former. It makes ‘sectarian’ identity a self-sufficient socio-political “entity”, and the state and its power-sharing formula will guarantee the continuity of sectarian institutions. 9. Many people view sectarianism as an age old historical division within Iraq. You’ve argued that sect is more situational, based upon the conditions within the country. Ethnosectarian politics are obviously dominant today. Can you see a time when things might change? What Iraq is seeing today is a conflict between centripetal and centrifugal forces in which oil resources is going to be a main factor. Centripetal forces seek more central control over oil industry and management of its income. This is a trend that the current prime minister is largely representing. Centrifugal forces prefer to reduce the central government and to establish institutional build up for resources distribution. The Kurds and some Sunni and Shi’a forces are inclined toward this choice. The more members of ethnic and sectarian communities think of themselves as such, the less national community would be imaginable. The balance between the two identities, the national and the sub-national, needs to be achieved through counter dynamics of desectarianization. One important factor is the change of behavior inside the political elite so that it would be more reluctant from using sectarian identity in political discourse. This may be encouraged through new laws that restrict communal discourse by political parties and the media; create a new electoral system based on small districts; stop the external funding coming to sectarian parties; constrain the possibility of forming parties with communal agendas; and, replacing ethnic and sectarian distribution of state’s positions by prioritizing alternative criteria like professional background and political orientation. If the change will happen, it is more likely to be through spontaneous dynamics of social and political conflict that create new political agenda. There are indications that a sort of multi-communal oligarchy is being produced in Iraq. If this trend will continue, class politics will be increasingly detached from identity politics. Cross-communal socio-political alliances may be forged either to defend the privileged groups or to represent the unprivileged. This will not necessarily lead to inter-communal solidarity in the explicit sense. It could rather lead to prioritize class-based politics and movements, marginalizing therefore the effect of communal backgrounds. Such a change is likely to produce new visions about what national community is; ‘Iraqism’ is better conceived in a political conflict that is not taking place on communal lines. However, such a movement is possible only if dynamics of sectarianization have been weakened. On the other hand, as the state grows stronger through oil revenues, social dynamics became more controllable, mainly through elites’ patronage and clientalism.